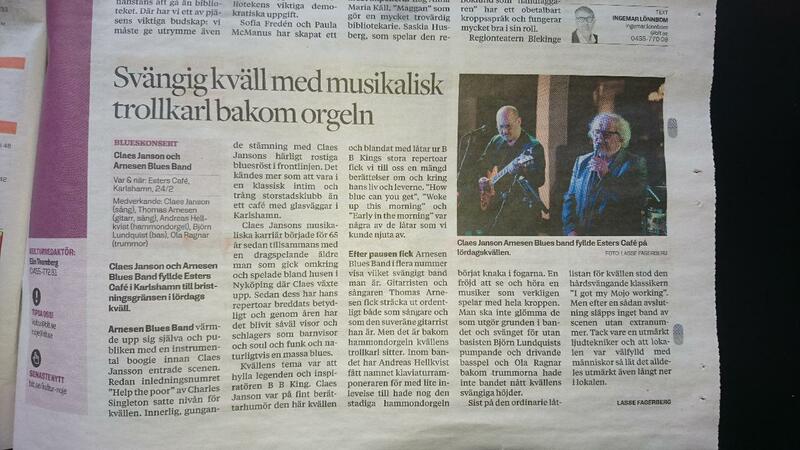 Last week I went on a short tour to the south of Sweden with Arnesen Bluesband and Claes Janson. This band is really one of the “cornerstones” of my musical life and we always have a blast playing together. Saturday night in Karlshamn was no exception and maybe even more to that. I put out a little clip from my solo on “Got my mojo working that a think captures the mood of the night. 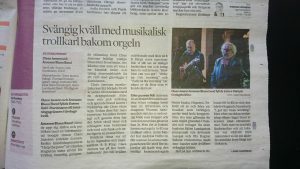 The review in the local paper was also very nice, with the headline “A swinging night with a musical wizard at the organ”. Anyway, hope to see you at some gig soon! Last year I got to know Kiralina Salandy, a canadian singer living in Stockholm. She started a band called Funk Ups and this has been one of the most fun new projects in a while! Hope to be working a lot with this band. Below is a video from a lounge concert at Globen, Stockholm earlier this year, just to give you an idea of what it’s about. Stay tuned! And 2017 is coming to an end. It has been a fun year in many ways. A few new projects has started 2017 and I’m very eager too keep working on them in 2018. I ended this year by going on a short trip to Pennsylvania to try out an organ I found on ebay. Here’s a short video from that. Hope you’ll enjoy it. And with that I just want to wish you all a Happy New Year! The last couple of months have been really busy there there’s a lot och fun things happening! Last week we played two gigs with my trio, and I put together a short video clips from one of my favorite songs combinning some different camera angles. Enjoy! It’s been a fun summer! 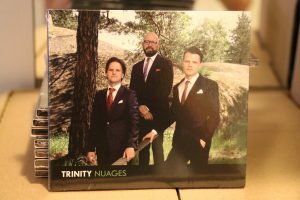 Though it’s not over yet, I think one of the things I will remember will be the concert on Monday July 31st, at Atelje Y, in Stora Skedvi, a village not too far from where I grew up. The venute itself is an old cinema for silent movies and has in recent years been turned into an arts studio and concert hall. And it is truly a beautiful place, inspiring in many different ways. And we had a lot of fun playing! Here’s a video compilation from the concert. About one minute from each song. Enjoy!